Some people will love the historic opening pre-credits to this episode. And I mean love. Twitter and Tumblr will be alight with all sorts of guffawing gifs and quintessential quotes from Peter Capaldi’s Twelfth Doctor as he breaks out the guitar once more and tells us all about the quirks of time travel. And some people will hate it. And I mean hate. No one is getting to think, “Meh,” or say, “It’s OK...” This is LOVE or LOATHE territory. This is about as divisive as Doctor Who gets. Right in the middle of a two-parter, full of death, mystery and intrigue, we stop to have a laugh with the Time Lord as he babbles on about Beethoven and rocks out. It's really quite jarring considering the events which have just taken place (The Doctor's dead, again) and the shift in tone results in much of the drama, that was so brilliantly built up in the preceding episode, is deflated and almost mocked. The levity of the situation in The Drum couldn't be made more irrelevant and frivolous. It's the sort of thing Tom Baker would have loved to have gotten away with in Season 17. Anyway, that’s just grumpy old me, I’m sure, nay positive, millions of viewers will find it hilarious and t(w)ittersome. 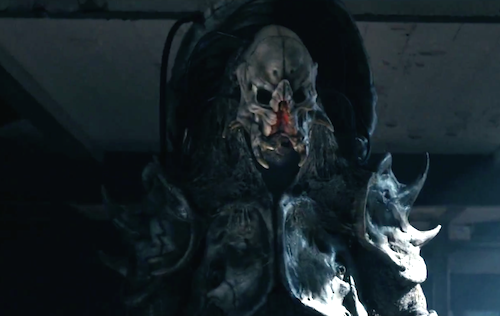 Thankfully, writer Toby Whithouse gets his game back on immediately post-credits with the Doctor arriving before the events of the previous episode accompanied by O'Donnell and Bennett. And instantly this adorable couple make for a fantastic set of companions for Peter Capaldi. Morven Christie is just stellar as the bolshy and excitable O'Donnell. As auditions for future companions go, she's nailed this like Robin Hood with a golden arrow. In this episode, she's given space and time to show off her character and I imagine she'll be a unanimous hit based on her cheeky, and knowing, persona. I do hope there's more to see from her. Likewise, Arsher Ali (Bennett) plays off Christie beautifully. Whilst not quite the same Amy/Rory dynamic, it's similar. Bennett is obviously in awe of his colleague and, as a duo, one can picture them settling into TARDIS life quite easily with her full of unbridled enthusiasm and he cautious and sickly. Whithouse has created, along with the terrific actors, two memorable and hugely likeable characters. Sticking with the cast, briefly, it's another tremendous performance from Sophie Stone as Cass; like Bennett and O'Donnell, she would make an amazing future companion for the Doctor. Also worth noting here is the excellent use of sound when Cass finds herself in The Drum's corridors; engaging and matches the tone of the threat extremely well. The trio of the Doctor, Bennet and O'Donnell make for one of the finest Team TARDIS units since the 80s. What they face back in time gets the story back on track as the mystery returns, but it's not good news for them as The Fisher King is awoken. At something like 9 or 10 feet, this is an impressive creation from the production team. And it's shot beautifully and tensely from a director new to Who, Daniel O’Hara, a cracking debut. There are a number of terrifically nail-baiting and breath-stopping moments as the monstrous beast (which would give the alien from Alien a run for its money in disgust and panic) stalks through the abandoned base in Scotland, looking for its next victim. 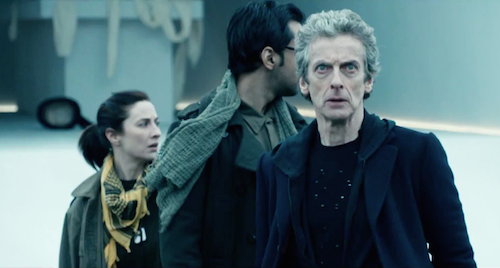 The showdown, in particular, with Capaldi's Time Lord is immense, a visual and dramatic treat. Top marks and a gold star also go to the voice of The Fisher King, the brilliant Peter Serafinowicz, who readers may already know as the voice of Darth Maul in Star Wars: Episode I - The Phantom Menace. However, like that nasty Sith Lord from 1999, The Fisher King doesn't get enough screen time for my liking and his threat, which is mightily impressive, doesn't come soon enough; it appears and disappears too quickly. Regardless, a fine realisation and one I hope to see again in the future. Curiously, and rather fascinatingly, both Clara and her Time Lord buddy come off as a tad selfish in Before The Flood. The teacher begs of him, "Die with someone else, not with me!" - whilst everyone's favourite Gallifreyan does appear to be mucking about with time for his own end. As I say, fascinating that this behaviour should occur. Intercut with the scenes in the past, we find the gang back at base where, unfortunately, the pace is halted. This is exacerbated too by The Doctor popping back to the TARDIS to speak to Clara and go on about how he must die. Again, this gets in the way of the drama's natural momentum; we know he's not going to die, just get on with telling the story! And the whole Doctor dying schtick is really quite tiresome, especially two stories in a row. Because of this, the second instalment has a much more fragmented feel and the answers to the questions posed are a little fumbled and unfocused. Add to that the Doctor's nonchalance to the situation (which bookend the ep), and the story comes unravelled and you're left with a number of great moments, super visuals, and three very strong guest performances (which include a number of very moving and touching scenes) but ultimately a sense of, "What actually happened?"